It was meant to be a celebration of a big deal. For WBC welterweight champion Danny Garcia was at a press conference with his team to announce an upcoming bout with WBA welterweight champion Keith Thurman live from the Barclay’s Center in Brooklyn on CBS March 4th. That, friends, is quite the news, for this will be the biggest match to hit “free” television since before Larry Holmes faced Carl Williams over thirty years ago. People are already saying the ratings for the fight might be through the roof for a boxing match. In other words, there’s excitement in the air. 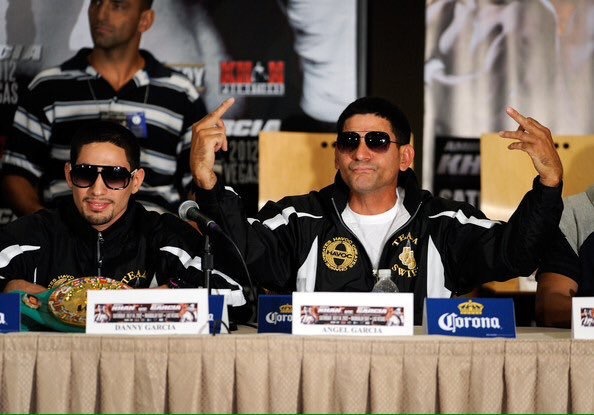 Unfortunately, Garcia’s father and trainer, Angel Garcia went on a nearly incoherent rant while Keith Thurman was at the mic. Even before then, however, he had made his presence known by announcing that “two white boys and a hippie” couldn’t defeat his son in the ring (clearly, he was referring to the free spirited Thurman and his team). That edgy bit of PR, however, was nothing compared to what he had in store seconds later. Not since the meltdown of Mike Tyson has this particular writer seen anything like it. Think Conor McGregor in what might be a near psychotic rage and you get the general idea. In truth, I don’t even really know what the elder Garcia said. The acoustics were all off at the Barclay’s, where the press conference was being held, to begin with. Angel’s hoarse voice yelling and antagonizing through the sound system made the words he was uttering a bit hard to decipher. The “N Word” was mentioned, as, I think, were some words on immigration. The elder Garcia also had what seemed to be some pro American things to say, though, again, I’m not sure what. Indeed, I don’t even know if the words he used to reference African Americans and immigrants were meant to be derogatory. I’m not trying to play nice here. I simply don’t know what the hell the guy was ranting about. To be sure, the entire thing was completely off the wall. Boxing is a most decidedly un-PC sport. It’s one of the great things about it. Genuine respect can generally be found behind off the cuff bluster. That’s something boxing fans understand and appreciate. Crazed antagonism of the kind showed by Angel Garcia today, however, isn’t called for or needed. The dude really needs to chill out. Having said that, the fighters themselves came across as gentlemen.